Since I started compiling my Movies You Might Not Know list half a dozen years ago, I have only included titles that were available on DVD. That meant leaving off some movies that I’d like to recommend, but couldn’t because you wouldn’t be able to find them. Every once in awhile, the studios find these little gems in their archives and release them on disc, and I then happily add them to the list. One is “Carny,” a 1980 drama about Donna, a bored waitress (Jodie Foster) drawn to the world of the traveling carnival that comes to her town. The carnies she falls in with are played by Gary Busey and Robbie Robertson (the singer/guitarist from The Band) as veteran hustlers who show her what their life is like behind the scenes. As she discovers, it’s a dark business, full of odd characters who treat each other like extended family, but are out to take your money any way they can. I was disappointed that Robertson didn’t do more acting after “Carny,” because he certainly had enough charisma to fill the screen. Busey, who had just become a star with “The Buddy Holly Story,” showed off his wild side here, while you can see Foster (then 18 years old) making the transition from kid roles (like “Taxi Driver“) to the grown-up performances that would later show her real potential as an actress. Caveat: don’t confuse “Carny” with a 2009 made-for-TV horror movie by the same name, starring Lou Diamond Phillips. 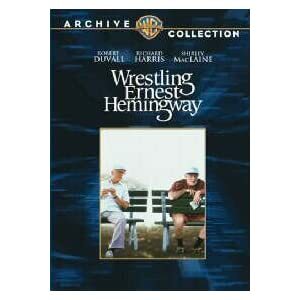 The other title I’m adding is “Wrestling Ernest Hemingway,” a character study of two old retirees living in the same apartment complex in Florida, who form an unlikely friendship. Robert Duvall plays Walter, a Cuban ex-barber with a penchant for bacon sandwiches, and Richard Harris plays Frank, a retired sea captain, with a penchant for Shirley Maclaine. The cast also includes Sandra Bullock, one year before her career took off with “Speed.” They all give marvelously subtle performances, and the interplay between Duvall and Harris is masterful. See my entire Movies You Might Not Know list and send me your suggestions, too.